This post was made possible by Opera through compensation. The actual contents and opinions are the sole views of the author, who maintains editorial independence, even when a post is sponsored. For more details, please read our disclaimer. I was sitting in a café with a friend of mine. I was complaining about ad-blocking. How I thought it was wrong. How I felt that it threatened the very existence of an independent media. Above all, how outraged I was that people were reading my content without paying (of sorts) for it. He had raised an interesting point. I know that advertising isn’t ideal, especially digital advertising, which comes with its own privacy, usability, and security concerns. Like most people, I hate rollover adverts and pop-ups. I’m conscious of the fact that far too many advertising networks have been infected with virus-laden adverts What Is Malvertising and How Can You Prevent It? What Is Malvertising and How Can You Prevent It? Malvertising is on the rise! Learn more about what is it, why it's dangerous, and how can you stay safe from this online threat. Read More . But is the situation really that bad? Do the benefits of ad-blocking outweigh the significant damage it does to online publishers? I think a lot of people in digital media – and I’ve been especially guilty of this – equate AdBlocking with theft. But according to PageFair’s 2015 Ad Blocking Report, 45 million people in the United States use AdBlock. The total figure worldwide is around 200 million. Their 2016 Mobile Ad Blocking Report states that mobile ad-blocking is massively popular in the developing world. Around 61% of Indian users have some form of advert-blocking browser installed. In Indonesia, that figure soars to 66%. It seems ludicrous (and it is) to think of all these people as thieves. It seems far more likely that they instead have some kind of legitimate grievance Publishers Need to Stop Whining About Adblock Publishers Need to Stop Whining About Adblock Ad-blocking seems like a natural option for any consumer because of a simple reason: it's an easy way to get rid of an annoyance. Read More with the way advertising has adapted for the digital age. I wanted to find out what that grievance was. My first point of call was Andre, from South Africa. Speaking to him was a challenge. We had arranged to talk on a Monday evening, but a fire alarm went off in his apartment block, forcing him to flee outside. We rescheduled our interview for the following day. When the Skype call eventually connected, I got a glimpse of what it was like to be a South African Internet user. The call lagged and stuttered, and then transformed into an incoherent blur of pixels. It looked like a Piet Mondrian painting. I had to struggle to catch each sentence. Eventually, we gave up, and I called him from my cell phone. South Africa has some of the best Internet on the continent, and a thriving startup scene to show for it. Internet penetration is significant. Despite that, there are some problems. For fixed-line connections, the state-owned ISP, Telkom, has a near-monopoly. This lack of competition has meant that South Africans pay more for their Internet than someone in the United States or England would, and they get a worse service. Data caps are routine, and speeds are way slower. And as Andre said, if he goes over his data limit, he has to pay. That means he’s effectively paying to watch adverts. Imran, from Karachi, Pakistan, has similar complaints. He’s part of the younger, switched-on generation. He’s university educated, and belongs to the nation’s thriving middle class. Like most of his friends, he accesses the Internet through an LTE router that is constantly plugged into the wall, and his trusty Android smartphone that runs FireFox and AdBlock Plus. He has a point. According to the Pakistan Express Tribune, Pakistan has the fourth-slowest LTE speeds in the entire world. With most people connecting through LTE rather than fixed-line connections, this is an issue that affects a lot of people. Imran also is adamant that since he installed an ad-blocker, his battery life has improved significantly. While this isn’t typically an issue for those in the West, Pakistan suffers from an overstretched power network, and is frequently hit by rolling blackouts. Anything that gives him an extra hour or two of battery life is welcome. My friend was right. Ad-blocking is a war. There are two conflicting sides who often seem irreconcilable, like hardened enemies. One side is the publishers and creators who insist they have a right to get paid. As a writer myself, I’m overwhelmingly sympathetic to this viewpoint. I know that I work incredibly hard, and I’m infuriated when people tell me that I have no right to get paid for the work I do. But on the flip side, there’s another argument which says that advertising has become too terrible to bear, particularly for those living in areas where the Internet infrastructure isn’t all that great. Since advertising isn’t getting any better, they’ve chosen to disconnect from it entirely. Opera is one company that embodies this conflict. It runs its own advertising network called Opera MediaWorks, which focuses overwhelmingly on a barely-tapped resource – mobile users. If anyone has something to lose by the unstoppable march of ad-blocking software, it’s Opera. But early this year, it also released an updated version of its browser which includes a built-in ad-blocker. Opera has made this front-and-center of its web browser. When you install it for the first time, you’re prompted to activate it. It can also be turned on in Settings. Just check the box that says “Block ads and surf the web up to three times faster”. If there’s a site you wish to support by whitelisting them, you can do so by clicking “Manage Exceptions“. From this point forwards, you’ll see a tiny blue shield in your browser. This shows that adblock is turned on. Clicking on it will show how many adverts have been blocked. You can even do a speedtest to see how fast a website loads with and without adverts. Surely it’s a massive contradiction for Opera to run an advertising wing, whilst simultaneously updating its browser to hide adverts? Perhaps. But it’s important to remember that Opera has a significant market-share in places where Internet access is least developed, and often most expensive. 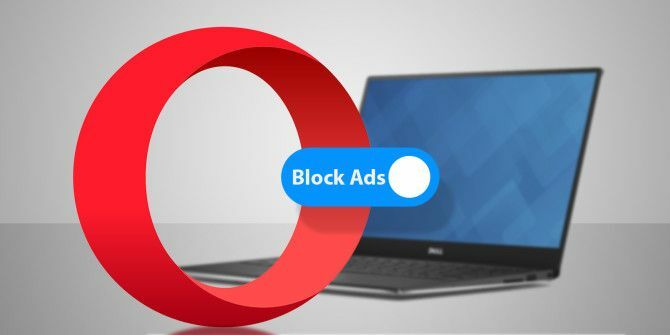 Even with Opera MediaWorks, it still aims to deliver a better browsing experience to users — especially those on mobile — even if that means occasionally blocking ads. The Norwegian company has always tried to service this market through features of its browser, like Turbo Mode. 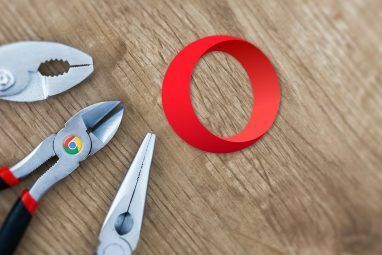 The decision to include an ad-blocker and a battery-saver mode How Ditching Chrome For Opera Will Improve Your Battery Life How Ditching Chrome For Opera Will Improve Your Battery Life There's a chance Google Chrome might be your laptop battery life problem. Thankfully, Opera might have the solution, with its built-in battery saver mode. Here's what you need to know. Read More only seeks to serve this often neglected market further.If this means that more people can enjoy a better Internet experience, I’m all for it. Try Opera Today on a Free Dell XPS 13! If you want to try Opera for yourself, download the latest version for your platform. In addition to bandwidth and battery saving features, it also comes with cutting edge security and privacy features. Opera is built on the fork of WebKit known as Blink, just like Google Chrome, so all your favorite web pages will work as normal. You won’t regret it. To help you get going, we’re giving away a free Dell XPS 13 ultrabook valued at $1,399, courtesy of Opera! Kitted with an Intel Core i5-6200U 2.3GHz processor with 8GB of 1866Mhz memory, Intel HD Graphics 520 and a 256GB PCIe SSD, this Windows laptop (along with Opera) will allow you to accomplish more with your time. Explore more about: Ad-Blockers, MakeUseOf Giveaway, Opera Browser. when will the winner be announced ?? Who is the winner? Opera! do you know if gleam.io giveaways always show up who the winner is or maybe sometimes the giver communicate in other way as well? Then who is the winner ???? Man, Opera's Ad-Block is rock! i have used many browsers but opera suits me the best. it has all the features and rocking fast. Man, ads always end up introducing a rootkit to my pc. So why bother thinking not all ads are bad? Even ones on yahoo end up having this issue. So why not use an adblocker? These sites don't give an f if I get a virus, so why should I care about their supposed lost revenue in lost ad revenue? It only takes one bad apple to ruin the lot of them, so why bother taking a risk? Viruses/trojans/rootkits reek chaos, not too mention stolen passwords, accounts, and even credit card info. To me, ad blocker stays on all the time. Mobile or desktop or laptop. Nail down the viruses and blinking ads, then I might care enough about the issue. OMG!! This is so amaziiiing!! you just wrote an article about blocking ads, yet you just used another way of delivering ads. you infused it into the article as a giveaway. not only did you advertised to me, but you implanted two distinct services into my brain. Opera for desktop or mobile and a Dell laptop which im actually about to buy. still deciding if getting a Dell or not. you see, i dont have to see intrusive and annoying ads on the side or left or all over the article. you just beautifully wrote it all in the article. I use adblock so I don't get viruses. The only time I have ever gotten viruses in my life they have come through ads that weren't screened or served properly and allowed people to inject viruses. And these were major platforms. I will never leave myself vulnerable again. This laptop is so dreamy! these Laptops definitely makes life smoother. Wow, I wish I could affort one of these marvelous laptops. I guess the Dell XPS 9350-1340SLV 13.3 Inch Laptop giveaway is for US residents only? I didn't see a disclaimers or contest rules. A few ads are one thing but when they literally make it impossible to post on or use the website it has gone too far & you are driving away your customers/readers. I understand that websites need/use money from ads to make money/survive. If those sites object people using adblockers then why don't they use a paid subscription model? My guess would be that they would struggle to find enough paying subscribers to survive. It's sort of catch 22 situation. I have to say that I love Makeuseof, they are an excellent site to get the most up to date info about anything doing with computers and many other things. If I need to know something I go to Makeuseof and get the info I need. I trust their info because they have some very intelligent people working for them and they know what they are talking about. I have never been steered wrong on anything I have looked up. I have learned a lot from the too, there is so much useful information on this site, it great! I hope you guys/gals never go away because you have helped me a lot and I look forward to learning more from you in the future too. Great Job Makeuseof, never stop being you. PS: would love to win too, but if I don't that's ok too, will still be a big fan of Makeuseof always. Michelle. I have used Opera for about a year now and I love it, you don't get that crashing like you do with IE and foxfire is bulky and has problems too, Opera loads quick with the ad blocker and I have not had any issues with Opera since I have installed it. Love the speed dial page too, put all your favorites right on one page, excellent idea. I don't have any problems or complaints of Opera and will be using if for a long time to come. Thanks Opera, finally a browser that you can actually use. Michelle. How about sites with adblocker blockers? They detect the extensions and make you turn them off and half the time they STILL won't let you read the page. A great website to learn and win. We would love to own a new computer for home and working from home. We all currently share one computer but I have to say I do enjoy my Dell Desktop all-in-one even if it is getting out of date. i use a 2nd gen core with 1gb ram and no gpu so i dont know if i will ever win but good luck to all of you!!! WOW. Pick me, pick me! Your next winner!!! Show me the money!!! It would be a dream come true and means more to me than anyone else to win. Starving artist here desperately needs the Dell to work and eat. Winner, winnner. Chicken dinner. A life changing experience. Top of my bucket list. Thank you for the awesomeness, the contest, and generosity. Dear Santa: I’ve been nice. My X-Mas wish this year is to win this contest. If you want people to stop stealing from you, shut down your website. Problem solved. ...On That Note, Whoever Introduced Never Ending Web Pages, Without A Configuration OptOut, Should Be Executed. Been using Opera for some time now, it is a good browser and you can use chrome extensions in it also. Just wished that chrome apps like videostream would work in it. Can people from America win? The referral link doesn't work properly, it links to a "Page not found"
How can I enter the contest if I keep getting a message that says, "has already been used to log in to Gleam." Hi Joseph - I believe that message means that your email address has logged into Gleam before - either by the Twitter or Facebook login buttons. Give those a go instead of Email (or whichever one you were using before, try the other). "the state-owned ISP, Telkom, has a near-monopoly.This lack of competition has meant that South Africans pay more for their Internet than someone in the United States or England would, and they get a worse service. " "One side is the publishers and creators who insist they have a right to get paid. " Really ? A right to have someone else pay you ? Seems a little extreme to me - even for you Mathew. I really fail to see how that obligation falls upon Internet users or even those sites posting the ads unless there was an agreement/contract. I prefer that radical and"extremist" liberal idea of free and voluntary associations (for those with full adult rights) where people get paid according to the contracts and agreements they enter into through their free and voluntary associations.. Your "Download now" button to download Opera takes me to gleam.io and asks me to create an account. Can you please fix this?